The Shelby Miller trade. Those four words haunt the Arizona Diamondbacks, and that one deal probably cost the last Arizona front office their jobs. It’s the worst transaction any team has made in recent history, and it was widely panned before Miller fell apart last year; having him fail so spectacularly certainly didn’t help the perception of the deal. But Miller apparently isn’t content to just let his name become synonymous with bad decisions. Coming off the worst year of his career, Miller looks like he’s trying to change his narrative, and the easiest way to do that is become a wholly different pitcher. During his tenure in St. Louis and Arizona, Miller basically developed into a pitch-to-contact guy, a mid-rotation starter with good stuff but didn’t miss as many bats as you’d expect. His success was built primarily on limiting hits on balls in play, as he ran a .274 BABIP from 2013-2015, which allowed him to run a 3.27 ERA despite a 3.87 FIP and a 4.10 xFIP. His 11.3% K%-BB% during those three years put him in the same tier as Bud Norris, Kyle Lohse, Matt Garza, and Wade Miley, so even though the stuff was good, the underlying numbers didn’t suggest that Miller was really a frontline pitcher. He just didn’t miss enough bats. So far this spring, though, all Miller is doing is missing bats. He’s faced 49 batters in his 11 innings of Cactus League work, and he’s struck out 18 of them, a 37% strikeout rate. Now, of course, it’s just Spring Training, but Miller has never done anything like this in previous build-ups to the regular season. Last year, he struck out 14 of 91 batters in Spring Training, and in his one year in Atlanta, he struck out 16 of 96 batters in Spring Training, as his March strikeout rates mirrored his April-September strikeout rates. And while you don’t want to care about a lot of spring training numbers, a big jump in a pitcher’s strikeout rate in March is one of the primary variables Dan Rosenheck noted could produce a substantial change in pre-season forecasts. If a pitcher who hasn’t previously racked up strikeouts starts blowing hitters away, well, that could be something to pay attention to, especially if there’s a tangible change elsewhere that reasonably explains the different results. And in Miller’s case, there is a pretty clear explanation for why he’s been a Spring Training strikeout machine; he’s now throwing Noah Syndergaard’s fastball. Okay, that’s a little bit of hyperbole, but Miller has made three starts at Salt River Fields over the last month, and helpfully, that ballpark has PITCHF/x cameras installed, so we have velocity readings for his outings there. And, well, here are the results in pretty picture form. Miller’s always had above-average velocity, sitting 94-95, but this spring, his four-seam fastball is averaging 97. He’s topped out at 99, and while he’s done that before, that was always just a one-off, but now Miller has been sitting in the high-90s for entire appearances. Shortened appearances in games that don’t count, but any time you see this kind of huge jump in how hard a pitcher is throwing, you have to take notice. And, with some added life on his fastball, he’s starting to get swings and misses with it, something he hasn’t really done previously. Batters have swung at 34 the 76 four-seam fastballs he’s thrown that PITCHF/x has tracked this spring, and of those 34 swings, 11 have resulted in a swinging strike. That’s a 32% whiff rate on his fastball, way up from the 21% he’s recorded in his career to date, and a number that would put him near the very top of the regular season leaderboards if he sustained it all year. So, Miller’s fastball is playing up this spring, and so far, he’s been throwing it past guys, giving him a needed out pitch that may allow him to move away from his pitch-to-contact history. Or, at least, go for the strikeout when he needs to. As a guy who throws his fastball an awful lot, a big change in fastball effectiveness could have a major impact on Miller’s ability to get hitters out, and there’s no easier way to make your fastball more effective than by throwing it in the high-90s. Now, though, we have to temper expectations a bit. For one, Jeff Zimmerman mentioned that it looks like the velocity readings at Salt River Fields are a bit higher for most pitchers who have thrown there, to the tune of something like a 1 mph “hot gun” effect. If the cameras at Salt River are just calibrated a bit differently than at other parks, perhaps some of Miller’s big velo spike is an illusion that will go away once he starts throwing in ballparks that have Statcast radars installed. And we should note that Miller’s velocity spike isn’t as large if you compare it to years other than last year, when his mechanics were out of whack and he didn’t pitch like the guy that STL or ATL had. Miller’s four-seam fastball averaged 95 back in 2015, so his velocity numbers now are only up two mph from that prior peak, and if some of that is a calibration issue, it may be more like he’s added one tick his fastball instead of three or four. If Miller’s got his 2015 fastball back and then a little boost from there, that’s nice, but he only ran a 20% strikeout rate in 2015 even while throwing harder than most starters. Plus, as always, there are sample size issues here. We’re talking 76 tracked fastballs, in outings where Miller didn’t have to pace himself to try and get through the order three times. Perhaps he’s just throwing as hard as possible in short-stints because he wanted to earn a spot in the team’s rotation, and now that the pressure is off, he’ll back off and pace himself a bit more. We can’t say for certain that just because he’s throwing harder in March means that he’ll be throwing harder in April. And finally, even if the velocity spike sticks, it doesn’t guarantee a huge performance change. Jared Cross sent me a list of every pitcher who had this kind of velocity bump over the last, and it’s not exactly a list of Cy Young winners. Tyler Skaggs got a huge velo boost in 2014, where he went from throwing 89 in the regular season to 93 in Spring Training, and while most of that gain stuck in the regular season — he averaged 92 mph on his fastball that year — his strikeout rate actually went down a bit relative to 2013, and then his elbow gave out mid-summer. The most encouraging breakout guy on the list is 2013 Tyson Ross, who sat at 92-93 and was pretty terrible in his last year in Oakland, but showed up in Padres camp sitting at 95, and his fastball averaged 94 during his first year in San Diego; his strikeout rate went from 13% to 23% and he became one of the better pitchers in baseball until he broke down. The Diamondbacks would certainly love it if Miller added 10 percentage points to his strikeout rate this year, and turned into the kind of pitcher that they were hoping to get when the team acquired him last year. 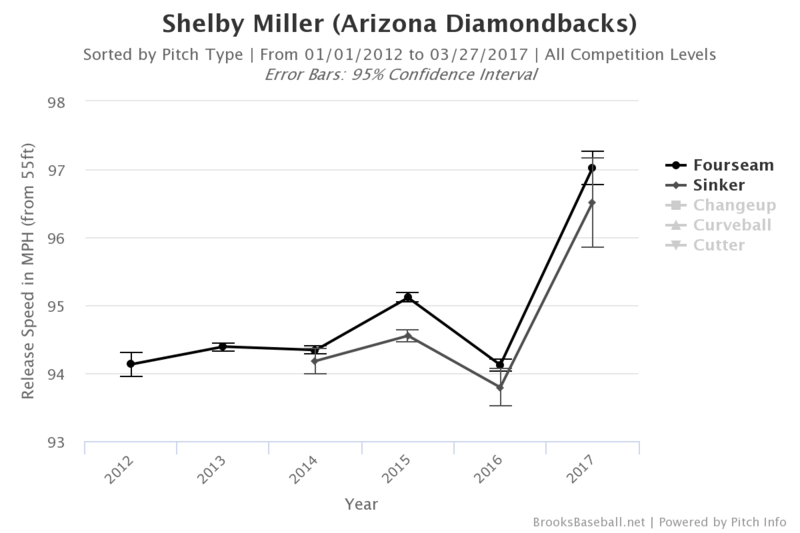 Realistically, it’s going to be almost impossible for Miller to ever pitch well enough to justify the package of talent he was traded for, but if the Shelby Miller who throws 97 and strikes everyone out shows up in the regular season, this deal can become a lot less painful for Arizona. We hoped you liked reading Shelby Miller is Trying to Salvage the Shelby Miller Trade by Dave Cameron! Good article, Dave. It was good to read excellent content without excessive hyperbole. Hyperbole is like the best thing in the entire world. Ever. How dare you disparage it with your calm and levelheaded demeanor!